CHARLOTTE, N.C. (AP) Three-time NASCAR champion Tony Stewart headlined the six new nominees eligible for induction into the NASCAR Hall of Fame. 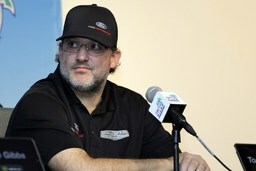 Stewart joined Neil Bonnett, a popular member of the "Alabama Gang," two-time Xfinity Series champion Sam Ard, former Daytona 500 winner Marvin Panch, short-track racer Jim Paschal and mechanic Red Vogt as the new nominees. Kirk Shelmerdine, crew chief for four championships with Hall of Famer Dale Earnhardt, was dropped from the ballot after only one year. There are 20 nominees and five are elected each year. NASCAR also announced three new nominees for the Landmark Award given for outstanding contributions to the sport. It meant Janet Guthrie was eliminated from the list after one year. Guthrie was the first woman to compete in the Indianapolis 500 as well as the Daytona 500, and her sixth-place finish at Bristol Motor Speedway in 1977 is shared with Danica Patrick for the top finish by a female in NASCAR's top series in the modern era. Three new nominees were added to the Landmark Award list and they were Edsel Ford II of Ford Motor Co., Pocono Raceway founder Dr. Joseph Mattioli and Mike Helton, the first non-France family member to be named NASCAR President. The 24-person nominating committee includes eight NASCAR executives, as well as Lesa France Kennedy, who is listed among 13 track owners and operators with voting power.